This is the Lighting Passport Flagship set. 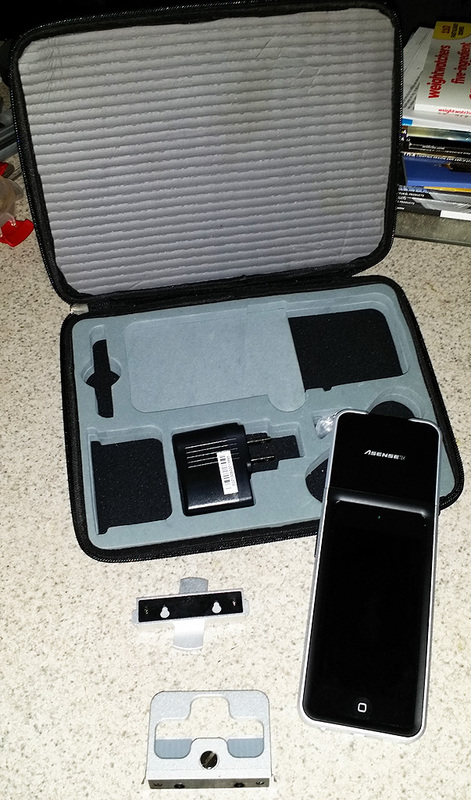 Includes case and accessories in a neat package. Du’v’ value. This is the missing piece of the CRI value we have always needed and were never provided. This tells you whether the light source is above or below the black body line. A positive value indicates the source will appear on the yellow/green side, while a negative indicates a tint of magenta will be present. When you put two sources side-by-side of the same CCT and CRI/CQS, you will see these differences clearly. Now, with the Du’v’ value, the difference will be quantified and usable in future comparisons when you don’t have both sources in the same room at the same time. S/P (Scotopic/Photopic) value. This is the value that will drive future lighting decision making. This indicates how well a spectral power distribution satisfies both the scotopic and photopic visual response curves of the human eye, which combine to deliver mesopic vision, and is the center of most current thinking in explaining why we find one source more visually stimulating and clear over another. This is also the value described by the IES in TM-24 13, where the application of S/P ratios can be used to reduce energy use, by taking advantage of the dynamic advantage of high S/P ratio light sources ability to generate increased visual acuity at reduced illuminance levels. PPFD, or Photosynthetic Photon Flux Density. This is the amount of light in umol/sec meter sq. in the spectral distribution (red and blue peaks over human vision in yellow green) that is used in lighting of plants. While not everyone will find this useful, when you need the data, this meter delivers it. Its also an interesting value when looking at how an artificial source and daylight compare, but that’s for another discussion. FWHM color value. This is an interesting value that shows the width of a products light output to 50% of its relative power in wavelength. This is an indicator of how broad the total power distribution is, and is very interesting when comparing two sources to one another. Peak and Dominant wavelength. Peak wavelength tells you where the highest output of a product is centered (in color), while dominant wavelenght tells you where it sits in CIE coordinate positions. ANSI bin and CIE McAdam Ellipse values. Based on a preset standard value for the CCT a source is nearest, you can see where the measured product sits within the standard ANSI color bin, and how far off in McAdam steps it is from the CCT standard center. 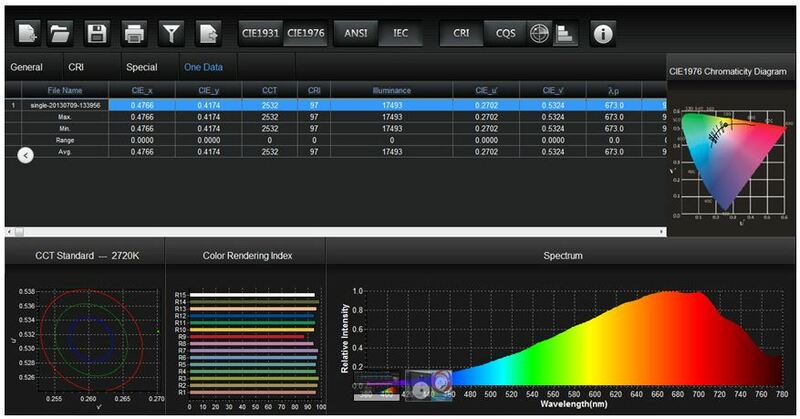 These are excellent tools in comparing two sources to one another of the same CCT and CRI, and along with the Du’v’ value will provide insight into what to expect in application of the products, in relation to color differences between two products. Multiple source comparisons and multiple readings of a single source. The Lighting Passport allows multiple readings to be taken and compared, or collected into database. This provides direct comparisons on the meter itself of two products to one another, or of multiple readings taken in sequence within one test session. This not only allows comparisons to be made objectively on all metrics, it provides a tool for evaluating color shift over light distribution patterns. For my own use, using this meter on a goneometer rig means I can not only collect the illuminance data necessary to define light distribution, but see how the color values shift throughout that light pattern. Light transmission accessory software. This small utility program is great for evaluating light transmission of materials, generating a simple report of the materials properties in both total transmission, and spectral transmission. 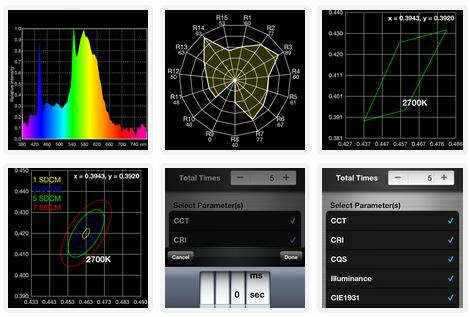 This is a tool that every lighting meter used for design should have. The range of information available to view on screen is excellent, clear and easy to read. Separate metering head operated by wireless (Bluetooth) connection. The small head size means not having the meter body height involved in the placement of the sensor, which can be an issue in task illuminance readings, where the light source is inside 36″ of the target surface. In all the other meters with an integrated head, the body height of the meter gets in the way of gaining an accurate measurement. The Passport includes a small stand attachment that allows the meter to be set where you need it, then stand back to eliminate the influence of being in proximity of the measured result. Works with ANY iOS device and Android 4.4.2 device, identically. That means phones, tablets and Pod music devices. So, if you already have an iOS or Android phone, you don’t need anything but the meter head, which slips into a pocket, to take for on-site measurement. This also means that use of a tablet sized device allows the meter and its output to be viewed easily by several people in a room, even projected onto a video monitor. In my case, I’ve connected the sensor head to my Samsung Note 3, and taken readings in a room with people viewing the results on an HDTV connected to the Note 3’s USB connector. This takes education sessions, product evaluation sessions, and general discussion and presentation to a level no other meter can match. Here’s another neat feature of this product – the interface software is open platform based, which means those with the need to create a custom interface for specialty evaluations have that available to them. This also means that updates to operating software through Android and iOS app outlets will make keeping the product current will be far easier than anything proprietary products can match. Separating the meter head from the display is an outstanding feature that allows it to be used in a wide range of applications, and not interfere with readings. 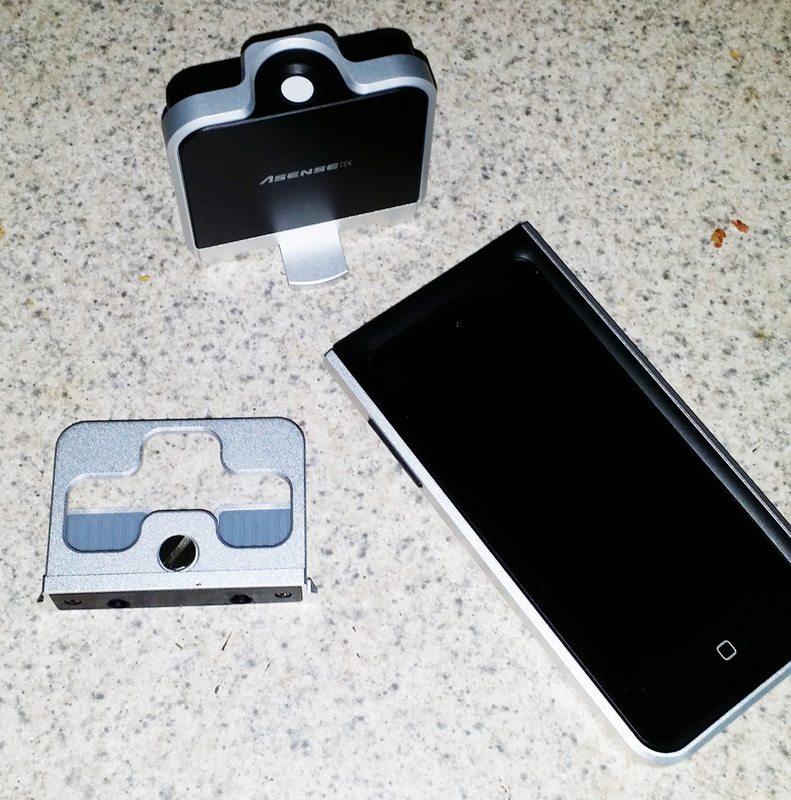 The little clip to the left attaches the head to any tablet device with a secure clamp feature. The lighting head is compact and when mounted on its provided stand, stable for remote measurement. It is also the only part you have to carry with you to a job site, should you already have the software installed on a smart phone. The meter and its design is impressive enough to be a reason to consider it, and is very usable as a stand alone. However, on top of this, the Spectrum Genius software creates an expanded opportunity for evaluating all of the collected data in a single screen, and compare sources, or multiple readings at once. This adds a layer of utility to the metering system that really enhances its use for those doing a lot of work in evaluating application results or products for consideration in specification. It also generates very nice reports, exports data into spreadsheet worthy data sets for use in other calculations. In my case, I export the data set from multiple reading sessions to create photometric reports that are used in conjunction with the spectral reports to create all of the same data one gets from an LM-79 report, in-house, of any product I can get my hands on. That means I have been able to compare LM-79 reports provided by manufacturers to test results of product samples – with interesting results. 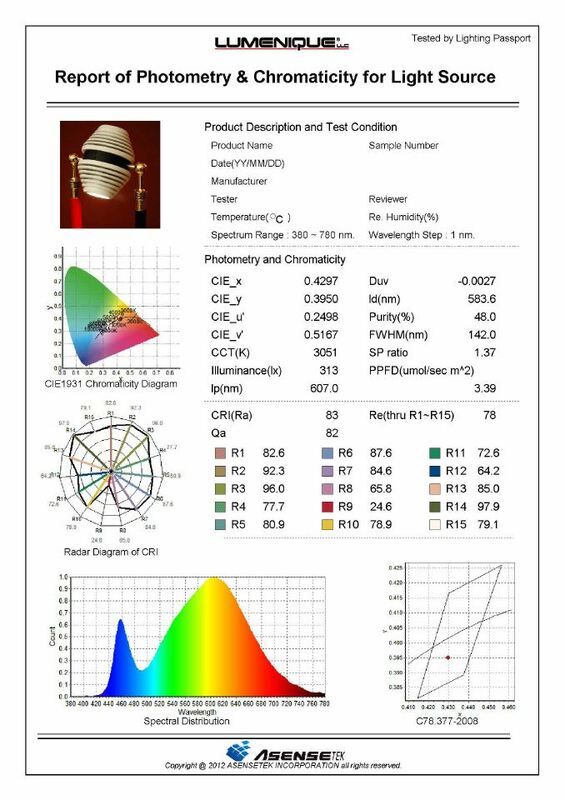 I can also provide preliminary LM-79 evaluations of products in the design phase for customers, before they are completed for final testing at an independent accredited lab. No more ugly surprises and re-testing issues when a product does not perform as needed or expected. The Spectrum Genius software puts everything in one place, making evaluation quick and easy to see. 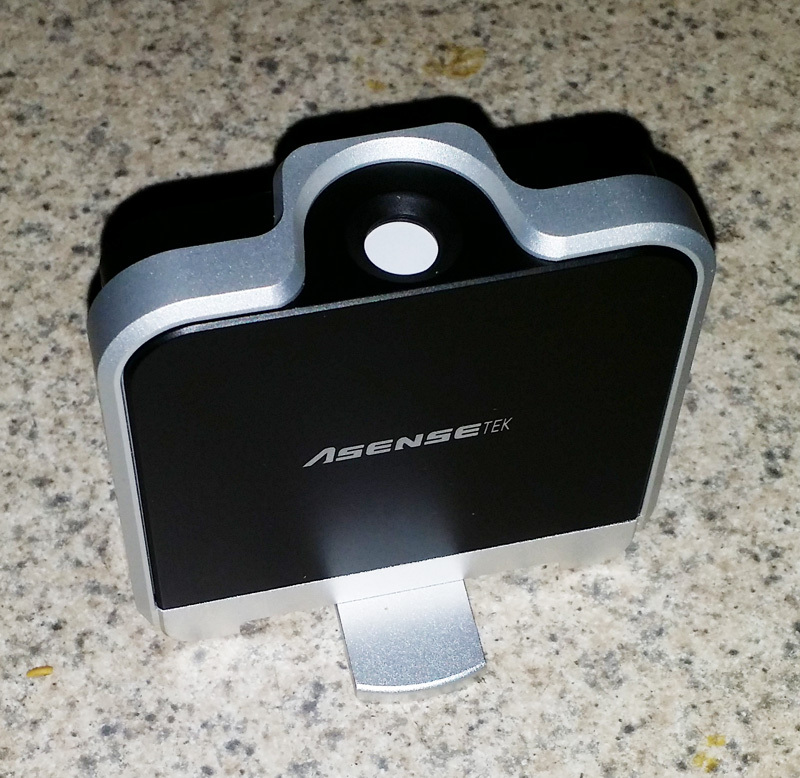 The Lighting Passport can be found in the market under the brand name Asensetek, and is sold in the USA by Allied Scientific Pro. The prices are wide open, you can order them on line, and with a range of between $1,500 to $2,500 for the meter and its attachments, plus software for free to $500, this package delivers a massive bang for the buck. This pricing is less than some of the high end white-light illuminance meters on the market, while delivering far more information. The product can also be calibrated, so can be used for precision applications and other uses where it is important to have backing for the data collected. The software is a little glitchy in its display, but not so much that I find it an issue. The software also creates a graphic error when creating a report using CQS, as it overlaps the data from R values with the Q values from Q7 thorugh Q15, which is truly annoying. I’m hoping this is resolved in future software updates. The software also uses a dongle for security, which some will hate. I like it, as I have the software installed on both my laptops and desktop, and can move the dongle between them for use anywhere. others will find the tether objectionable I am sure. The transfer of data from the meter to the software is through email or iTunes over wireless, although you can upload the data by file explorer in Android devices. This is fine with a smart phone, and works just fine with the iPod device provided in the Lighting Passport Flagship set (with wireless availability). It would be nice to be able to connect directly from a desktop through wireless to download stored files, but this is not a serious problem, and more an issue with the devices themselves – separate of the meter system. I find no compelling need to operate the meter from a desktop, as the remote head and hand held ergonomics of the data collecting device are just fine. In a lab space, use of an Apple mini-pad or other tablet device works quite well, and eliminates the need to have a computer dedicated to lab duty where it sits unused most of the time. The package of components are well thought out, and well designed. Quality is very good. If you look at the last image showing the component package (older version of the system), you will see that the light entry port at the top of the meter has a flat diffuser for cosine correction. recessed slightly into the body. If you look at the image of the head shown earlier in this article, you will see that later versions of the product has an added frame at the top of the sensor body, that wraps around the meter opening +/- 270 degrees. This actually creates some obstruction of the meter opening at very low angles, which will produce poor results. In fact, all flat diffuser cosine corrected meter designs will create errors at very low incident angles, which are compounded by the recessed position of the diffuser itself, now compounded by the additional decorative detail added to the sensor body. For these reasons, the Lighting Passport is not suitable for evaluating outdoor lighting conditions that include measurement of very low incident angles. For this application a dome shaped cosine diffuser is necessary. For the majority of indoor lighting conditions, this should not present a significant limitation. On another note, the latest versions of the product now measure flicker values, and the newest Spectrum Genius software, with on-line file access, now produces a range of human factors values, such as melanopic lux, circadian stimulus, and many others for those evaluating human factors and effects of an installed lighting system or product source. I think the product has some problem that you don’t find. You can try halogen lamp and you will find something wrong. Another problem is you can repeatedly measurement and you will see the problem. I have had no issue with the meter under halogen, daylight, HID or LED sources. All results have been as expected, with good repeat-ability. I have no idea what Lin is commenting about, as he did not elaborate or provide any details. I tested several different light sources, including fluorescent and halogen lamps and found no issues with the results, in either repeat-ability or accuracy. However, testing sources back to back demands you isolate all variables, such as distance, background lighting conditions, reflection from surrounding surfaces, etc.. If not, readings will not repeat exactly, especially if the meter is hand held, where small changes in distance, angle, surrounding influence, etc. will change the readings. That said, these meters all have an issue with reading creep when taking numerous measurements one after another. The issue is the heating of the sensor array, essentially a CCD, that is used in these affordable level products. If you take many measurements in short succession, the readings will increase in variability as the sensor heats up. To avoid this, simply allow time between readings to allow it to cool naturally. Very high end, lab grade meter sensors use different technologies, including thermal sensing fold back loops with programmed active adjustment of readings, and/or active cooling to eliminate this issue. Having hand held devices exhibit this behavior is not a problem of the meter, it is a dynamic of the configuration and design, that occurs with all of them to some degree. 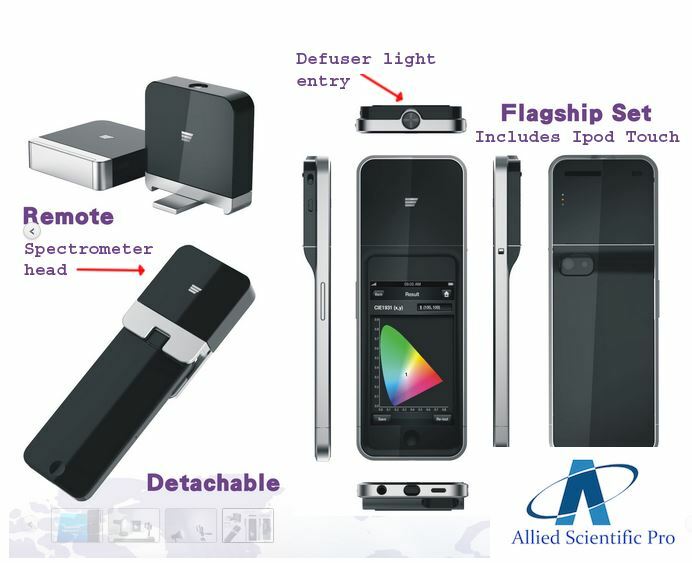 you did a very good job describing this handheld spectrometer. I like it as well. Just like to mention, that the team from Asensetek is the most innovativ team I ever have met. They are open in implementing new features. Never be surprised when starting the app on smartphone and getting new release with another feature. this way using apps make it very easy to be up to date instead of renewing uploading firmware in complecated ways on other handheld spectrometers. I also like the split of the sensor and the smartphone. So I can easily start measuring independent from the sensor. It is like remote controlling of the sensor. Guys who prefer German are invited to use the German webpage (see link). Lets keep an eye on this developement. More and more guys are needing such equipment based on the so different quality of LEDs. This meter reads 25% low on outdoor lighting using LEDs. Much of the error is due to its poor lens design for accounting for cosine correction of low incident light. As you can clearly see in the photos that one side of the meter has a higher acceptance angle as the otherside. Very poor design. Looking at the newest product and how the housing wraps around the top of the meter body, I have to agree, that their is an issue with cutoff at very low incident angles. Further, as a point of reference, flat diffuser cosine correction will never do well measuring low incident angles, like that one might experience measuring roadway lighting. Good catch. I’ve added a post-script note on this to the main article.